The market is unfair if only because 10% of participants manage 90% of funds. An ordinary trader has slim changes to stand against these "vultures". This problem can be solved. You just need to be among these 10%, learn to predict their intentions and move with them. Volume is the only preemptive factor that faultlessly works on any timeframe and symbol. First, the volume appears and is accumulated, and only then the price moves. The price moves from one volume to another. Areas of volume accumulation form reliable support/resistance levels and are regularly "tested" by the price providing the best market entry opportunity. The method of trading using this indicator comes down to trading from one strong area to another. 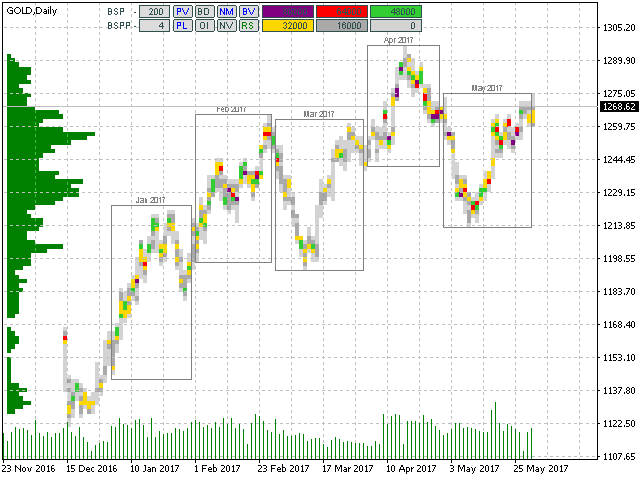 The BoxChart indicator calculates volume clusters, sorts them according to their completeness and marks them in appropriate colors. In addition, the indicator sums all clusters and displays the result on the price axis as a horizontal volume scale (the market profile). The indicator works on all timeframes available in the terminal, but uses historical data of smaller periods (relative to the current one) M1, M5, H1, H4 and D1 for calculations. Before launching the indicator, download the history of these timeframes by scrolling the chart to the left. If there are no data, the indicator displays the appropriate message and perform drawings only where the data are available. 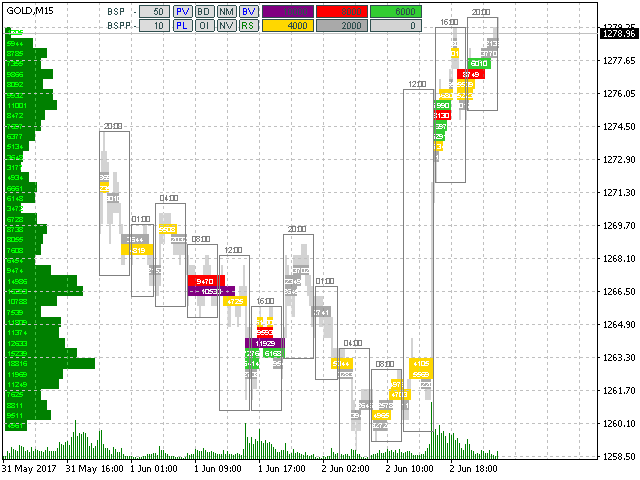 The indicator performs all drawings only in the chart view area but you can scroll the chart to the history. The clusters may "blink" when scrolling the chart. This is a normal behavior since they are being re-sorted. Clusters having the same color but different length (within a single price line) are approximately similar by their volume. 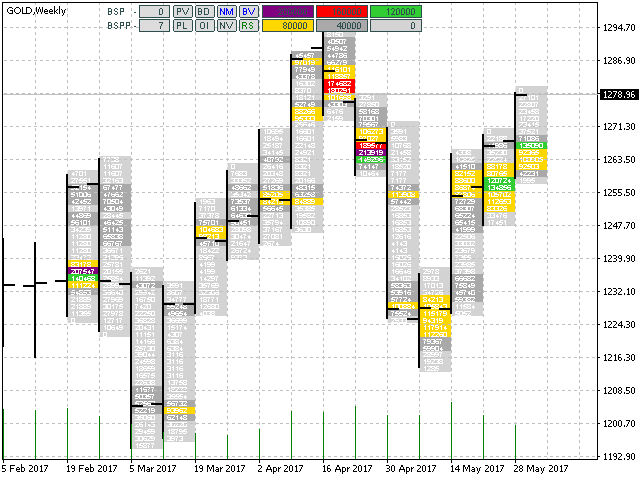 BSP – increase/decrease a fixed step of a price grid. Set in "old" points. If 0, the calculation step is taken from the parameter set by the BSPP button. 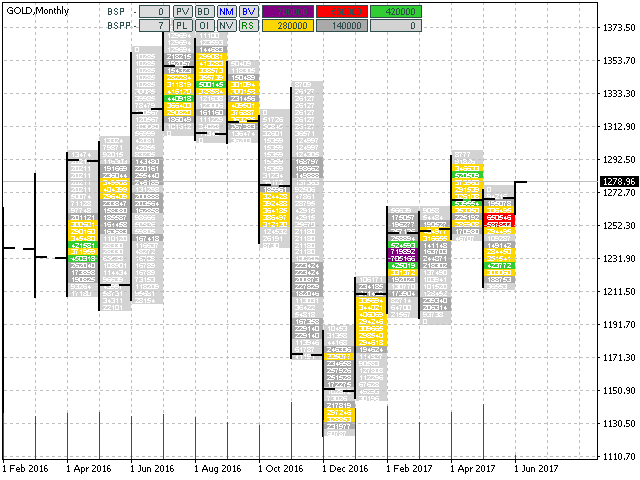 BSPP - increase/decrease a dynamic step of a price grid. Set in monitor pixels. PV – enable/disable the volume profile. 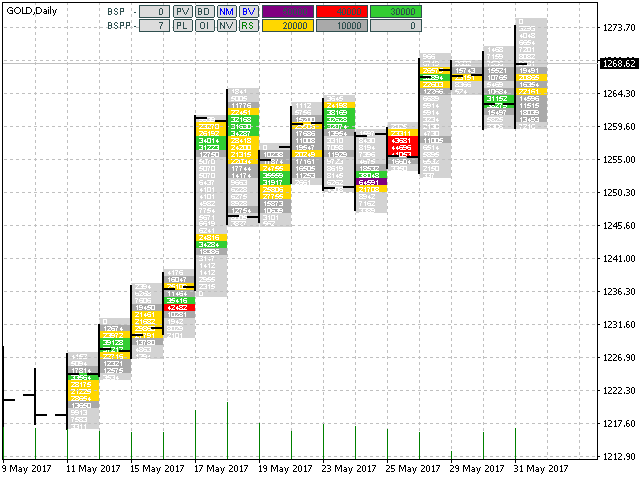 PL – volume profile to the left/right. BD - in this mode, each cluster contains the volume concentration rather than the volume itself. The cluster volume may be relatively small or even imperceptible, but its high concentration per time unit indicates high activity on this candle (candles) and on the given price level. OI - enable/disable the open interest mode obtained mathematically by consecutive zeroing of mutually absorbing volumes. Only the volumes unaffected by the operation are left to be displayed in the clusters and the profile. NM – enable/disable the mode of line-by-line splicing of adjacent clusters. NV – in this mode, the volume scale is not taken into account at all, while completeness of the clusters and the profile is calculated using the TPO principle. BV – enable/disable period frames. RS – reset to default settings. DigitalFontSize – font size of labels on clusters. BordresFontSize – font size of labels above the period frames. Auto sorting of clusters is performed in increments of 1/6. As a result, we have six color graduations. The color matching of these cluster graduations can be adjusted with color variables: LowestBoxColor - up to 1/6, LowBoxColor - up to 2/6, MiddleBoxColor - up to 3/6, MediumBoxColor - up to 4/6, HighBoxColor - up to 5/6, HighestBoxColor - up to 6/6 of the maximum accumulation in the visible area. The manual sorting of clusters is set by users via the following inputs: HighestBoxValue, HighBoxValue, MediumBoxValue, MiddleBoxValue, LowBoxValue and LowestBoxValue that set the upper cluster volume level, above which the cluster receives the appropriate color. The remaining inputs refer to other color settings, and their purpose is clear from their name. Все работает, СПАСИБО. Полезная штука!!!! Отличный помощник в торговле ! Можно точно определять уровни и интенсивность проторговки! Спасибо автору за отличный и очень полезный индикатор!!! New fields have been added allowing to enter the date/time of the beginning and end of the cluster display area. All entered values are applied and remembered immediately after you finish entering them, the RS button now only resets indicator parameters to default values. When you install this version, the indicator settings will be reset to the default values, since settings are now stored in a file, not in global variables. In version 2.8, the value area is highlighted in the profile. A repeated click on PV (while the profile is enabled) enables the display of horizontal lines of the VAL, VAH and POC levels. Now, the manual sorting of clusters by color is available directly from the chart by entering values to the fields having the appropriate colors. The indicator saves entered data individually for each timeframe. After entering or changing the values, press RS once to apply them to sorting the clusters. If all six values are equal to zero, the indicator switches to the auto sorting of clusters. Note: RS button saves its initial function of resetting the indicator to the default modes only if both BSP and BSPP parameters are simultaneously set to zero when pressing it. Improved the algorithm of auto sorting of clusters by color. Also, added the ability to manually sort clusters by color. The HighestBoxValue, HighBoxValue, MediumBoxValue, MiddleBoxValue, LowBoxValue and LowestBoxValue inputs allow you to set the upper cluster volume level, above which it receives the appropriate color. Manual sorting is activated in case of any non-zero value of the mentioned variables except for LowestBoxValue, which can be equal to zero. Fixed errors when drawing boxes of certain periods for the trade symbols traded only during the work day. Adapted the step of the BSP calculation grid to symbols with integer quotation. Fixed the periodic flickering of the indicator. The indicator automatically determines if the broker broadcasts real volumes and switches to them. If there are no real volumes broadcast, the indicator works with tick volumes. In addition, the indicator now also works on the W1 and MN periods, period ranges are, respectively - quarterly and annual. Fixed the color errors in the indicator control buttons. ButtonsFalseTextColor – text and border color of the inactive button. Added the button BV – Borders Visible, enable/disable display of period frames. Added the button RS – Reset, reset the indicator to default settings (only for the selected period). Increased the maximum calculated grid to 500 points. This is especially important for the symbols with a very small point value relative to the chart height, for example, GOLD and some indices. Expanded the options for increasing a calculated grid in points. You can select from 1, 5, 10, 50, -50, -10, -5, -1. Like in the version 1.8, the indicator memorizes if the chart shift is enabled, as well as the shift size. Fixed lack of display on a last bar at each Friday in Not Merge mode. Period frames can now be disabled. If their color is equal to the chart background one, the frames are not displayed. Added the buttons allowing you to select the grid increment in points and pixels (located near BSP and BSPP ones). First, select an increment (+1, +5 or -5, -1), then click BSP or BSPP button. The calculation grid will then increase/decrease by the specified amount of points/pixels. The indicator remembers its settings for each period of each symbol, including PV, PL, BD, OI, NM, NV buttons status, calculation grid step, calculation grid increment, as well as some chart parameters: display mode (candles, bars, or lines), tick volume display and horizontal scale. It is very convenient, especially if you frequently switch between periods. The settings are saved, and you do not have to constantly re-adjust them. In the Not Merge mode, at the maximum horizontal chart scale, a numerical value of volumes is displayed for all boxes/clusters if a box height (in pixels) exceeds that of a font specified by the DigitalFontSize variable. As a result, we can see a common cluster chart for a selected period. Fixed lack of display on the last bar. Fixed incorrect box marking in the open interest filtration mode (numerical value was marked correctly). Added the NotMerge function – volume accumulations are not summed up and not clustered into larger boxes. Instead, they are analyzed in each candle separately. The function allows you to analyze the volume map in greater detail. Please note: The function does not freeze but consumes considerable CPU resources, especially at higher timeframes and fine calculation grid. Bsp – BoxStepPoint, calculation grid step in points. Bspp – BoxStepPointPix, calculation grid step in monitor pixels. PV – ProfileVisible, enable/disable profile. PL – ProfileLeftPosition, profile to the left/right. BD – BoxDensity, density (concentration), the function is not active in NotMerge mode. OI – OpenInterest, open interest filtration mode. NM – NotMerge, described above. NV – NoVolumes, tick volumes are not used in calculations (pure FootPrint). The main indicator management functions have been moved to the chart buttons. Volume accumulation areas and profile are now marked with numerical values as labels directly on each box and profile. BoxTextColor and ProfileTextColor variables set the color of the labels. DigitalFontSize variable sets the font size of these labels. Volume accumulations of the Lowest category are not labelled. Added the OpenInterest function. Volumes - accumulated below and used above (buys followed by a sell) - nullify each other. Volumes - accumulated above and used below (sells followed by a buy) - nullify each other as well. The volumes remaning after the filtration form an open interest. We do not know its direction with certainty, but its location on a chart can be used as a clue. A gradual disappearance of a previously detected open interest means that it has already been used and the market reversal is near. Do not look for an open interest on a long interval. You will not find it due to its occurrence frequency and subsequent implementation. Only the current open interest is important for analysis. A completely new principle of display of volume clusters. Now we see only volumes on every part of the chart, on each of its candlesticks. For convenience, change the chart to the "line" view, disable the chart display by going to chart properties and setting "none" for its color, and view only volumes on the chart. The ExcessRemove function has been removed. Now, to remove what you do not need, simply turn off the colors of the boxes you do not want to see. Improved the accumualtion sorting algorithm. Box colors are now more stable and less sensitive to chart scrolling, re-sizing, as well as horizontal and vertical re-scaling. Amount of price graduations reduced to six. Accumulation sorting step is 1/6 of the maximum accumulation in the visible area. The color variables are divided into LowestBoxColor - lowest, LowBoxColor - low, MiddleBoxColor - below average, MediumBoxColor - above average, HighBoxColor - high, HighestBoxColor - highest. Improved the accumulation sorting algorithm. Box colors are now more stable and less sensitive to chart scrolling, resizing and rescaling in horizontal direction. Changed the default variable settings. As a result, box colors are now more stable and less sensitive to chart resizing and rescaling in vertical direction. New variable settings can be used on any symbol and timeframe. Both line and bar charts are now available for display in addition to candles. Added ExcessRemove function: if there are a few adjacent boxes on a random vertical chart axis, only the largest of them is displayed, while the rest ones are removed. Added BoxDensity function: in this mode, each box shows the volume concentration rather than the total volume. The total volume may be inconsiderable but if its concentration per time unit is high, this is a sign of high activity on that candle(s) and that price level. The function provides good reversal points. The ProfileLeftPosition variable allows you to set the profile to the right of the chart. If 'true', the profile is located to the left, if 'false' it is located to the right. Period frames are now distributed the following way: М1 – M15 frame, М5 – H1 frame, М15 – H4 frame, М30 – session frame, Н1 – daily frame, Н4 – weekly frame.